Grow Up in the Air! OUR YOUTH AERIAL ARTS CLASSES RUN IN CONJUNCTION WITH THE FAYETTE COUNTY PUBLIC SCHOOL BREAK SCHEDULE. The proper attire for Youth Auditions: Intro to Silks is leggings past the knees and a tight fitting workout top or leotard. Youth Auditions: Intro to Silks is a two class series for any child over 8 years old wanting to try out aerial silks for the first time. We will move through a series of introductory movements that involve training the basic techniques, climbs, lifts, and poses on the silk as well as safety tips and proper alignment. This class is a pre-requisite to enrolling in any of Sora's Youth Programs. Click to register. This two class intro series is typically offered the last 2 Fridays of the month at 6pm and is $35. The classes are to be taken in sequential order. Classes begin with a 15-20minute warm up. Please be sure your child arrives promptly. If you child misses the warm up, we may ask your child to sit out. Registering for Youth Aerial Rec class is the next step once your child has completed Youth Auditions: Intro to Silks and has been approved by the instructor to move on. Youth ages 8-17 can enjoy 50 minute aerial arts classes in order to learn the leveled skills in aerial acrobatics. Choose between taking 4 classes per month (1x per week), 8 classes per month (2x per week), or 12 classes per month (3x per week). Students are expected to attend the same day/time each week for the month. This program is perfect for the student new to the aerial arts and/or the student who enjoys aerial acrobatics classes as a hobby. *payment must be made by first day of class, each month. Auto-draft options are available. *attendance policy is sign up and show up, no make-ups. Space in this program is limited. Speak to your child's Youth Rec teacher if your child is interested in enrolling in Intensive. The students in this program are Sora Aerial Arts' Junior Company. Youth ages 8-17 are eligible only with instructor approval for the Youth Intensive program at Sora. This program is designed for students who take their aerial and performance art training seriously. Students who enroll in this program will get performance opportunities in the community that other students will not, including opportunities to be in Sora's productions at local theaters, charity events, community outreach and more. The programming in Youth Intensive is designed to help each student make progress in all aspects of being an aerialist and performance artist including strength, flexibility, endurance, stage presence, artistry, and multiple apparatus. Being an aerial performer takes discipline, LOTS of hard work, creativity, and commitment! 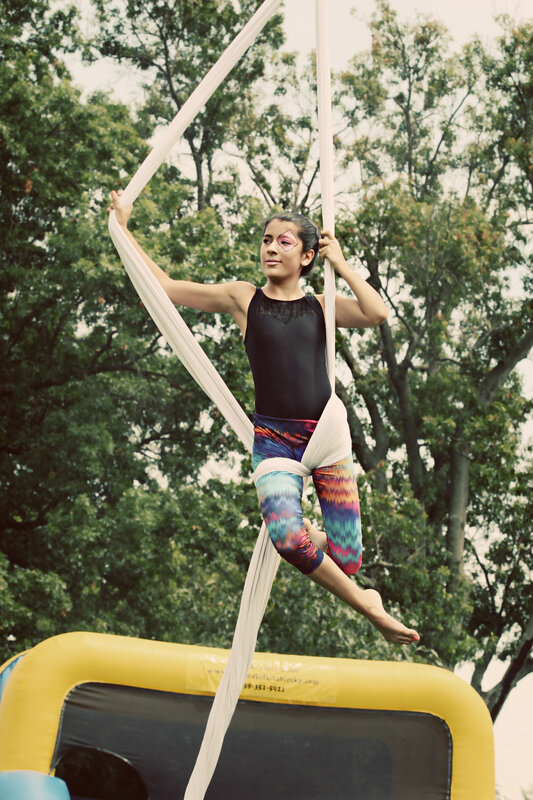 We offer week long summer camps that focus on performance and circus arts including aerial acrobatics, dance, gymnastics, partner acro, acting, juggling, performance training and more! 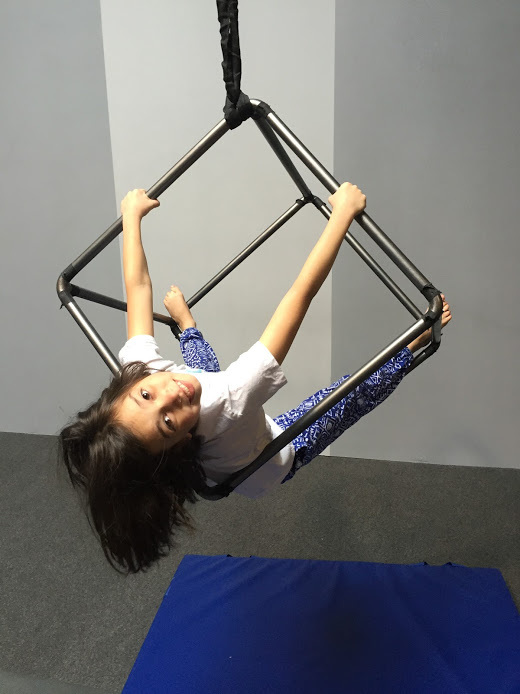 Kids and teens ages 10-17 are eligible to register for summer camp at Sora Aerial Arts. On the last day of summer camp parents and family are invited to watch the circus production the kids created that week! Performance Group from Summer Camp 2017. The theme of the production and the entire camp week this year was DREAMS.